It was probably eight to ten years ago the first time I made homemade french fries*. I made them a few times. Back then, we had a deep fryer. I baked fries, and I fried them. I didn't really love them though. For the past several years, I have purchased french fries in the freezer aisle, and baked them at home. 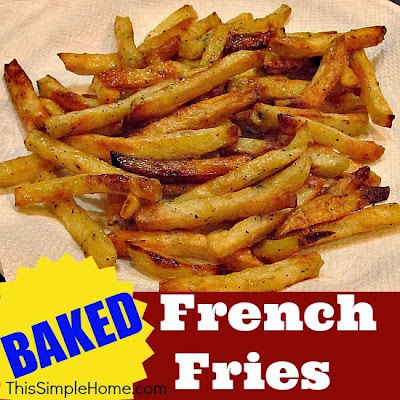 I've been trying to make a bit more of our food myself, so I went to Facebook to ask my friends how they bake their fries. I needed french fry advice, and my friends didn't let me down. This recipe is a bit of a combination of all their advice. *See a personal note below. Wash and peel potatoes. (Or leave on the peels.) Slice the potatoes. Place the french fry slices in water for 20+ minutes. (Now is a good time to preheat oven.) Drain the potatoes and pat dry. Return to the bowl and drizzle a little EVOO on them and stir. Sprinkle with salt and pepper and stir some more. Bake on a thin, metal cookie sheet at 450° in the lower part of the oven for 35-45 minutes. Turn every 15 minutes. Remove from cookie sheet to a paper towel and pat to remove oil. I use whatever potatoes I have on hand, usually white or red. For my family of five (with three young children), I use four or five potatoes. (We like homemade french fries!!) I also place about a teaspoon of salt and a bit of pepper in a small bowl. Then I use my fingers to sprinkle the salt and pepper on after the EVOO has been spread around well. I don't use all of the salt, but think it's more effective than sprinkling it on from the shaker. I have been using parchment paper to keep my fries from sticking. I suspect it makes them brown a bit less, but it's worth it for easy clean up. Keep in mind if you soak the fries and like them crispy, you may need more than an hour after cutting the fries to prepare these. Mmmm..... sounds yummy. Jeff got me a deep fat fryer and we use it from time to time to make homemade potato chips, which is popular. I have to say, I don't mind buying potato chips since we rarely eat them...and Herr's factory is right down the road! We love them! I make our like this too...minus the soaking time. :) Love em!! I think I do prefer the soaking time, though if I'm in a hurry, I will skip it. I'm curious how you and Ticia slice potatoes thin enough for chips! A much healthier version to the typical fried french fries - thanks for sharing and linking up with us at #WWDParty. Happy Sunday. I made home made french fries last week for the first time in awhile. (We love them, it's just that htey are work!) I read a tip about soaking your potatoes first but I didn't try that this time. They were still enjoyed but next time I'll try soaking and see what kind of difference that makes.